PARIS — A lavish party at the Palace of Versailles to celebrate Carlos Ghosn’s second marriage and his new wife’s 50th birthday has come under scrutiny as Renault, the French automaker, questioned whether its former chairman and chief executive misused company funds to pay for the Marie Antoinette-themed bash. Mr. Ghosn personally benefited from “an exchange worth 50,000 euros,” or about $57,000, “in the framework of a philanthropic accord” with Versailles, Renault said in a statement on Thursday, adding that it had alerted French judicial authorities to its finding. France’s justice ministry had no immediate comment on whether authorities would pursue an investigation into the 2016 party. If they do, it would open a new front in a probe of Mr. Ghosn over allegations of financial wrongdoing while he led the world’s biggest car alliance. Mr. Ghosn faces charges in Japan for underreporting his income while chairman of Nissan, the Japanese car company that partners with Renault and Mitsubishi in the alliance. He has lost the helm of the alliance and has been removed as chairman by all three carmakers. Renault gave a €2.3 million contribution to the Chateau of Versailles in 2016 as part of a sponsorship deal to finance renovations, Versailles said in a statement Thursday. In exchange, Renault had the right to use space, once the palace of French kings, for an equivalent rental value up to a total of 25 percent of the contribution. The contribution came from the budget of the office of Renault’s chairman and chief executive — at the time, Mr. Ghosn. Any Versailles properties used under the sponsorship arrangement were to be used exclusively for company activities like team building, and not for personal events, according a person with knowledge of the situation, who was not authorized to speak publicly on the matter. Versailles said in the statement that Renault asked to rent space in the Grand Trianon, a mansion on the palace grounds, and an adjacent gallery for a dinner on Oct. 8, 2016, the same day that Mr. Ghosn threw his party there. The use of the spaces was valued at 50,000 euros, the statement said. The French daily Le Figaro reported on Thursday that an invoice from an event company organizing the reception recorded the rental as being “offered by Versailles,” suggesting that it was a personal gift to Mr. Ghosn. While no money exchanged hands, having a personal wedding reception at Versailles under the sponsorship deal could be considered a misuse of corporate assets, a criminal offense in France that carries penalties of up to five years in prison and a fine of €375,000, or about $425,000. 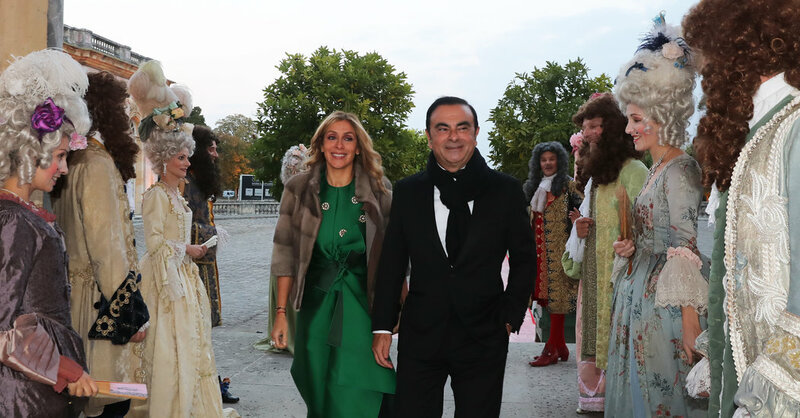 The black-tie reception featured actresses dressed as Marie Antoinette, in hooped skirts and powdered wigs, welcoming Mr. Ghosn and his second wife, Carole, along with 120 guests. The reception hall was tended by white suited-waiters and tiered golden dishes filled with macarons, as well as a towering, pyramid-shaped wedding cake made of chou pastry. Photos of the party have circulated widely on social media in France during the Yellow Vest protests against inequality as a symbol of excess wealth. Renault began looking into Mr. Ghosn’s financial activities in France after he was arrested on Nov. 19 on his private jet at Tokyo’s international airport. He has been in jail there since. While a steady drip of allegations have emerged from Japan about Mr. Ghosn’s activities, this is the first time that Renault has publicly acknowledged potential wrongdoing. Until now, the company said its internal review had showed no problems with his finances in France. Renault and Nissan have also been carrying out a joint inquiry into a Dutch corporate entity that Mr. Ghosn headed, Renault-Nissan BV, which Japanese authorities say Mr. Ghosn had used to finance extra benefits for himself, including the purchase of several homes with Nissan money. The inquiry is being headed by Mazars, a Paris-based auditing firm, and will look into executive compensation, payments to consultants and general expenses, according to two people familiar with the situation. For weeks, Renault stood by Mr. Ghosn. As it became apparent Mr. Ghosn could not be released on bail before a trial in Japan, he resigned, paving the way for the French automaker to appoint a new chairman and a new chief executive. Mr. Ghosn has said he is innocent of all charges. He said in recent interviews with Japanese and French newspapers that he was the victim of “plot and treason” by other Nissan leaders who wanted to thwart his plans to bring the alliance partners together under one holding company.